The tonal options on this high calibre instrument will blow you away. The finish is beautiful, the look is stunning and the sound it produces is heavenly. This Grestch G6120TM Tiger Maple Flame is made in Japan. Chet Atkins was a country legend whose unique playing style was often imitated, but never duplicated. Nicknamed "Mr. 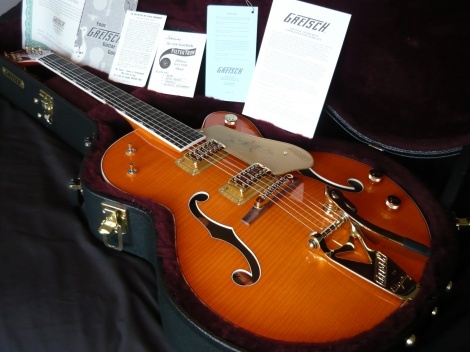 Guitar" Chet was almost as famous for his work with Gretsch designing guitars as he was for his complex and unmistakable playing style. The Chet Atkins hollowbody is a throwback to the classic hollowbody guitars Chet made famous in the '50s and '60s. The flame maple top, back, and sides are absolutely stunning and lend a more modern vibe to this legendary guitar. The ebony fingerboard is adorned with neo-classic thumbnail inlays.